Someone came up to me in a wheelchair and said, “Thank you. You have given me hope. When I became disabled, I never thought I could live in a beautiful place.” If you make something better for people with disabilities, you make it better for everyone. 1. 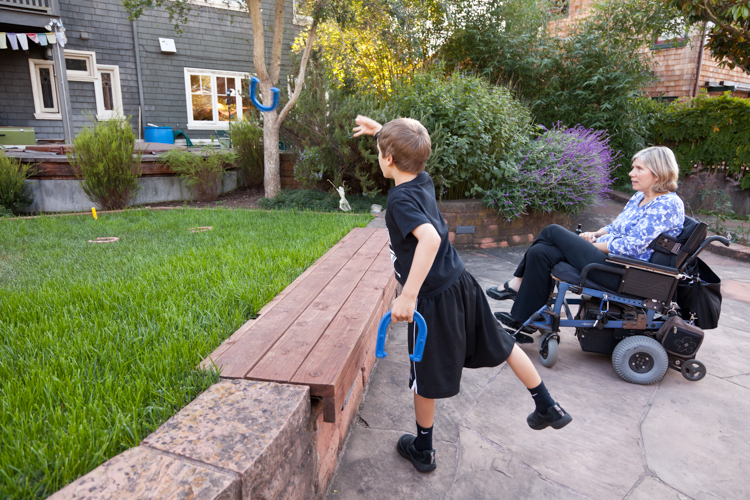 What led you to the mission of being an accessible environments and homes architect? 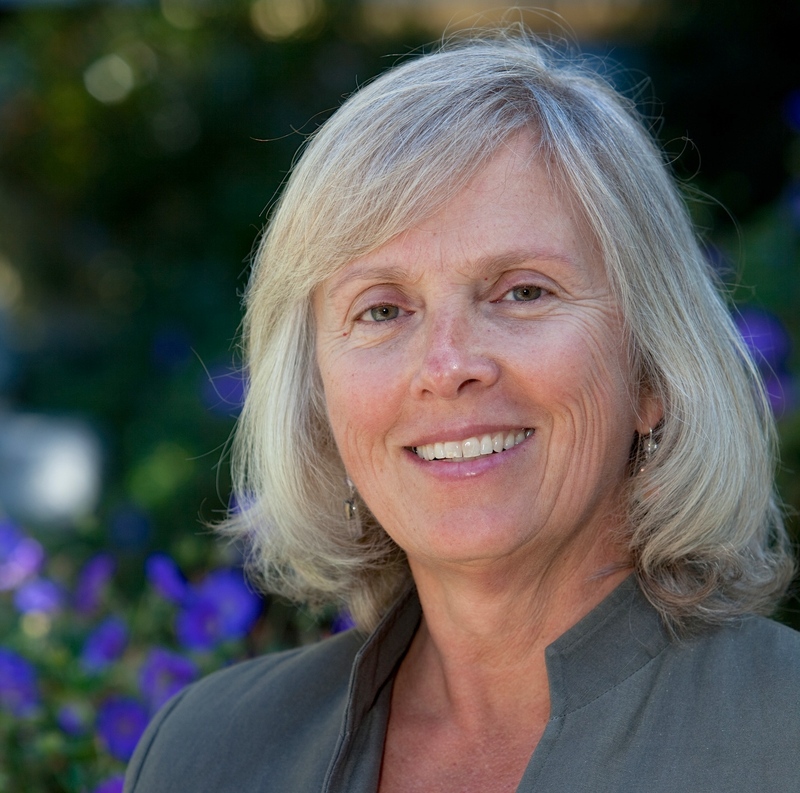 As I saw my profession paying less attention to the issues of the aging environment, I saw my clients and my friends needing help more than ever. I saw an opening or a hole in the soul of the profession. I didn’t think we were doing as much as we could to make an inclusive society and inclusive environment. Buildings often discriminate between people who have abilities and people who have disabilities. When we make an environment for people who have no disabilities, we are excluding those who have disabilities. When we make an environment that is user friendly for people with disabilities, we make it easier for everyone. Inclusive means an environment that includes everyone. I’ve written a book about accessible designs called The Accessible Home: Designing for All Ages and Abilities. The book showcases thirty-five homes that were designed around and for people with a disability. The homes are spectacular – not in the sense of being large, but in the sense of being happy places where people can live well. The book features pictures and ideas. There are stories of how people make decisions and face their lives after disabilities. The book can be enjoyed on many levels whether the reader has a home renovation in mind or not! It’s about home design and home remodeling. 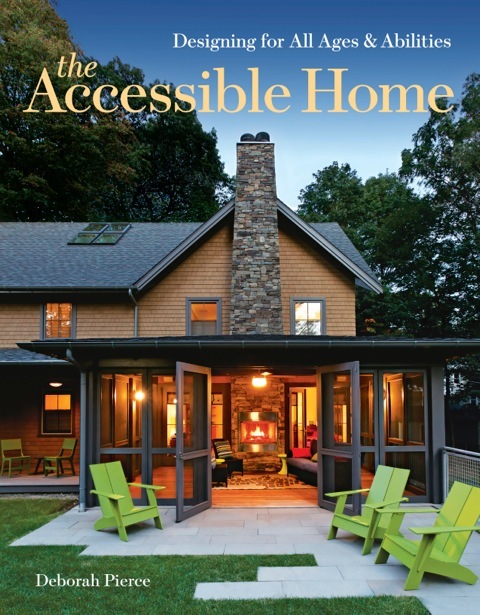 (To see a sample of the first part of Deborah Pierce’s book The Accessible Home: Designing for All Ages, click here.) Photos are by Kathy Tarantola. It means a radical rethinking of what the home is. 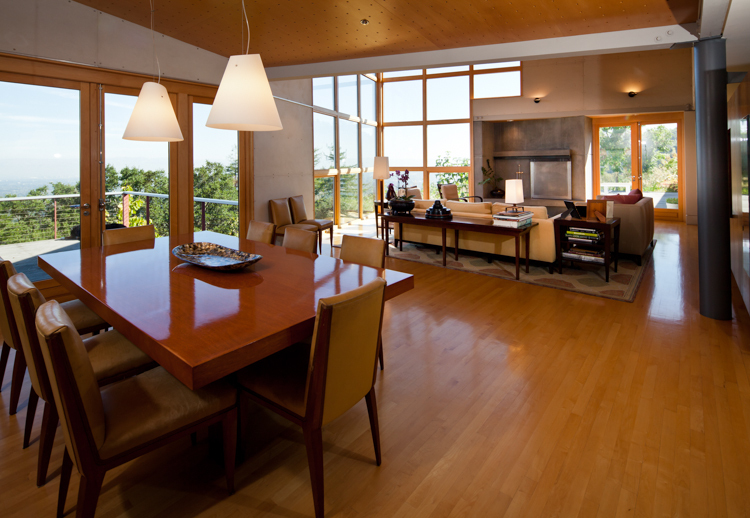 For example, home should be a place where visitors can easily arrive and enter. That means no steps. Some visitors might have trouble walking or need mobility devices to get around. I’m sitting here with my shoulder in a sling because of shoulder surgery. It is hard to use many of the objects of daily living without the full use of an arm. Opening doorknobs, opening jars, turning on light fixtures, turning on plumbing fixtures — we really need to be using lever controls rather than buttons and knobs. Yet many people still build homes using only knobs. 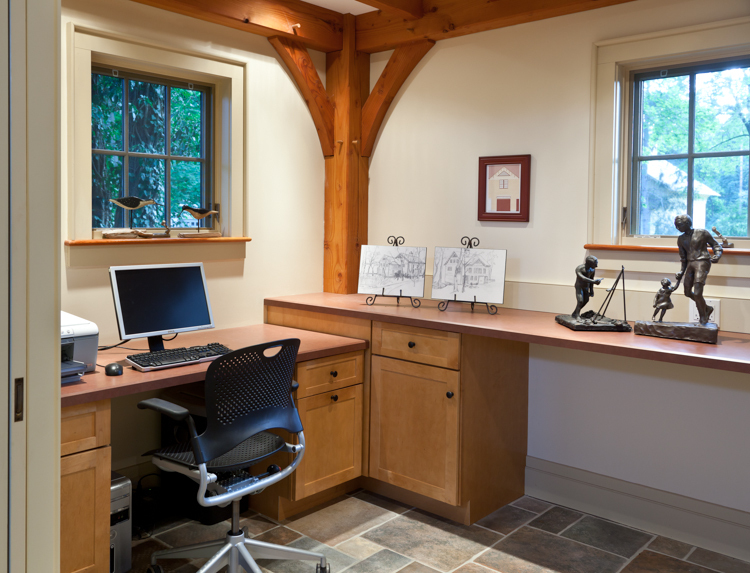 For a person who can’t see well, building an accessible home means including adequate lighting. Yet many houses only have single bulb in the ceiling. If a person can’t hear, accessibility means good acoustics. Acoustic environments are not being produced for homes. Acoustic accessibility is more in the vocabulary of architects working on assembly halls and public spaces. 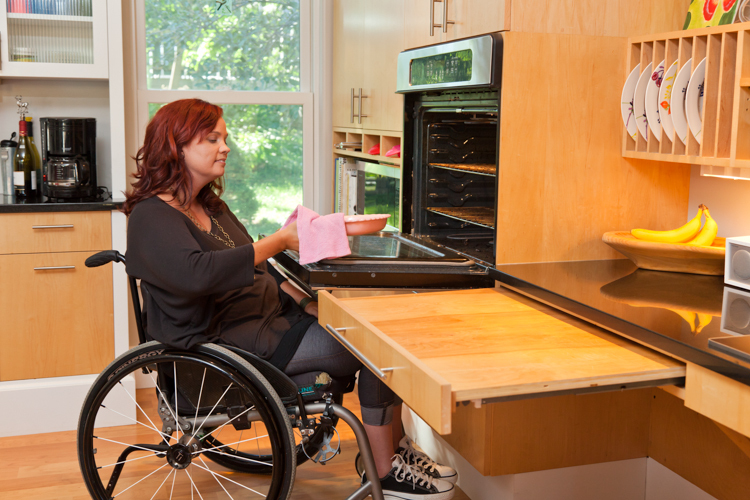 Building accessibility means an ergonomic kitchen. The place that needs to be most easily reached is the kitchen countertop and yet that is the place where there is no storage. As people get older and get shorter, they can’t use high kitchen shelves. I can’t raise my arm above my waist, so I can’t use them now. 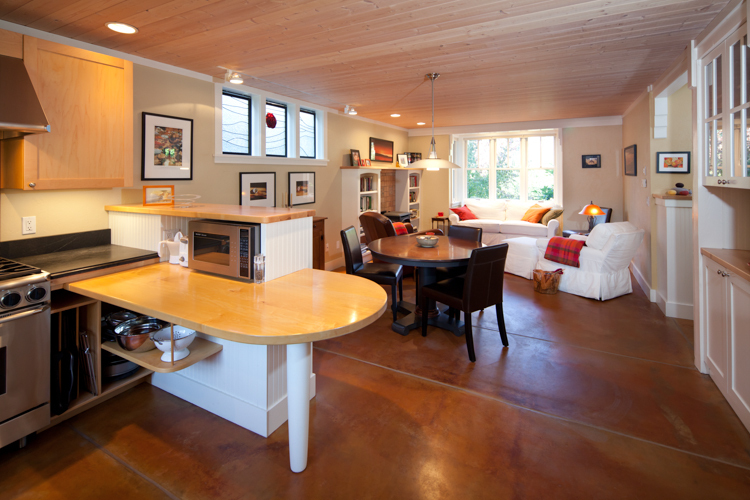 Kitchens need to be more ergonomic and they need to be more efficient. Functionally they should be more like the cockpit of a jet airplane – everything within reach and the things you need most frequently should be the most easily in reach. Then there are the bathrooms. We are not making bathrooms that are safe. People fall all the time in the bathrooms. Sixty percent of hospital emergency room visits due to home accidents are related to people falling in the bathroom. People of all ages are prone to these accidents and yet we make bathrooms that are shiny and hard. It’s a simple matter of putting safety handles, good ventilation, rounded corners, and enough maneuvering space so that if a person falls they can get up. The door should be opened in the right direction so falling on the floor is not going to block the entrance to someone coming in to help them. If someone needs help there should be enough room for two people to be working in a bathroom. I think we should have bigger bathrooms and smaller kitchens and no walls in the living spaces. Laundry rooms should be in the living spaces, not in the basements. Since I started being interested in accessible homes, I have changed the way I design them as well! 3. 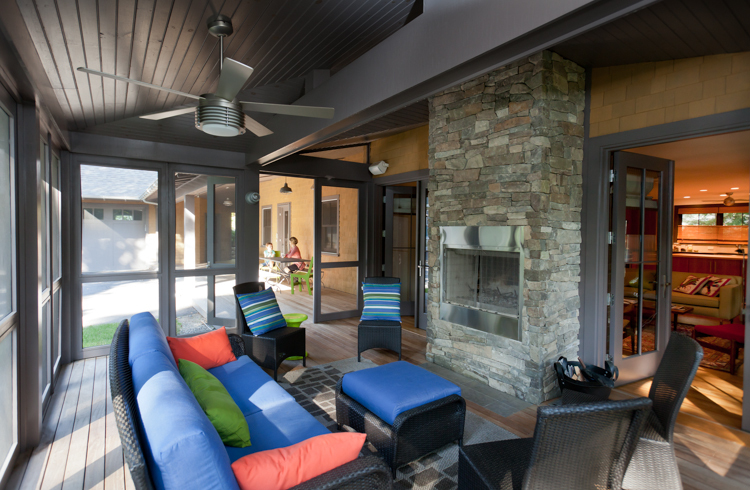 What was your best day as an accessible environments and homes architect? Some great days have been while writing my book. This has involved meeting with someone who had a disability and who modified their home in a way that made them no longer disabled. When you are not limited from doing something, there is no disability. I found that the creativity and ingenuity and perseverance that people bring to the task of making a home or environment where they can be their best – is inspiring and exciting to me. I knew I needed to write this book. I was leading a seminar in Los Angeles and I was presenting the winning design for an awards program about accessibility. Someone came up to me in a wheelchair and said, “Thank you. You have given me hope. When I became disabled, I never thought I could live in a beautiful place.” I think we have all lowered the bar where disabilities are involved. I include in disabilities the normal process of aging. We have stopped thinking of design as something that makes a person’s life better. The American Disabilities Act (ADA) has been real landmark legislation because it has raised people’s awareness of the need for accessible environments. At the same time it has been seen as a lot of red tape so people shy away from trying to make the appropriate changes. We’ve lost sight of the fact that this is just good common sense design and that designer of all sorts – architects, interior designers, kitchen designers, bathroom designers – all designers will have the best brought out in them if they can make a place that is more functional and more delightful to be in. That’s really what the design industry needs to be focusing on and that’s what homeowners need to be demanding. I define design as solving problems not just making a building beautiful. Accessibility is the architectural response to disability. When I talk about disability, I’m not just talking about people in wheelchairs. I’m talking about all of the variations that occur within a person’s life such as injury and illness. What about people with baby carriages? They need accessibility too. Take for example curb cuts when they were first installed in the 1980’s. People realized that not only could people in wheelchairs use them, but also people with baby carriages, people on roller skates, little dogs, someone with arthritis in the knees – people who can’t life their legs very well. The idea of universal deign was born – if you make something better for people with disabilities, you make it better for everyone. I’m grateful for those people with disabilities who have made a nuisance of themselves, because without that we would not be having this conversation about accessibility. Without their efforts, we would not know what is required to make user-friendlier environments. 4. 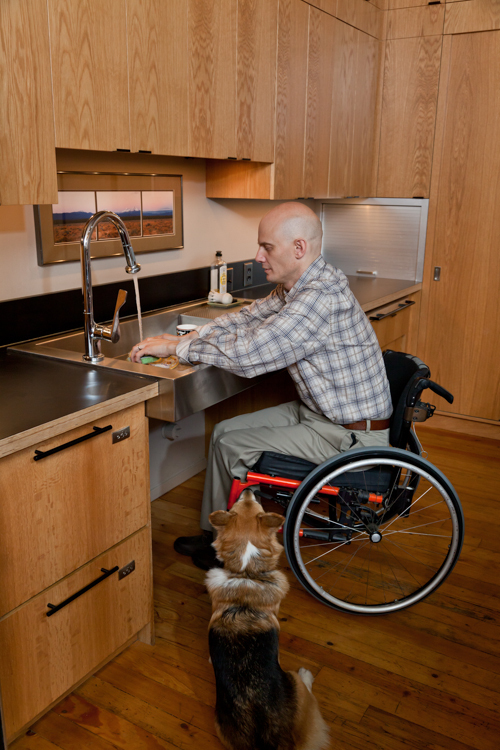 What was your worst day as an accessible environments and homes architect? My most frustrating moments is when I am working with someone who does not have a disability and I am trying to lead them toward making certain decisions that will allow their homes to serve them if they should become disabled or when they become disabled and they don’t want to hear about a more inclusive design. I find that frustrating. Sometimes people want something familiar – even if it doesn’t work – rather than something new that will work. Many people would rather have a doorknob because they are used to using them. But levers work better! I find some people are unwilling to consider another way. 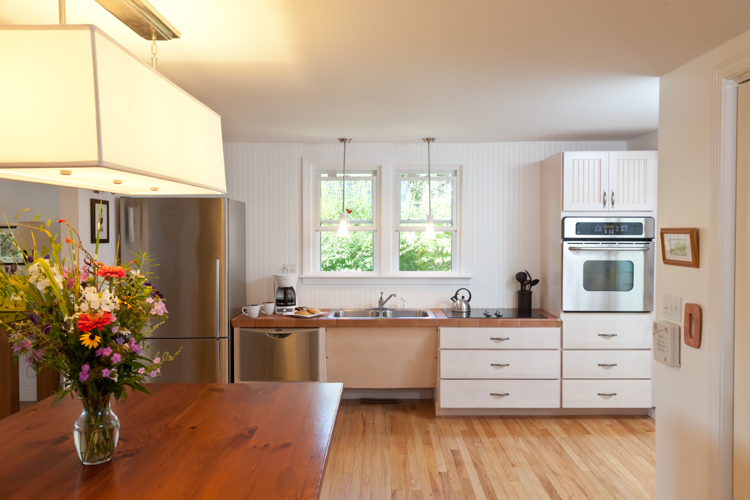 When a house is being remodeled, change can be unsettling so the better, more accessible changes are not made in the final plans. This is one of the most frustrating times for me. I usually have enough going on in my life that I have others things that I can focus on. I pay attention to what is going well. I am mindful of the blessings in my life — from how hot coco tastes to the smell of fresh laundry to the colors of the leaves in the fall. Mindfulness and staying present is a real good response when things are not going well. With a rapidly increasing baby boomer bubble, we are going to have unprecedented of older people with disabilities of all sorts – ranging from diabetic neuropathy, arthritis, heart conditions to full disabilities such as being mobility impaired, dementia or having vision and hearing loss. This is an area where there will be increasing opportunities for people to have employment and create services and products. It’s a really rich area of professional endeavor in many fields. Our culture has been youth oriented. That is changing. People living with disabilities are bringing courage and adventure to every day life. There is a lot to be gained personally from learning their perspective. I know people who have faced some of the worst challenges life has to offer and they are still standing and are fearless. Whether that means people have had a serious illness or a serious misery, they have had to modify their expectations and recreate their lives. They have exuberance and a creativity that is infectious. There is a wisdom that can only come from experience. This wisdom and creativity is something that I had not seen before I was focusing on accessibility. It is really deeply satisfying and it motivates me to be my best.